The Village has been treating for mosquitoes by applying larvicides to public street catch basins and storm sewers to inhibit mosquito larvae from developing into adults. Recent rainy weather has created environmental conditions favorable for increased mosquito breeding on both public street areas and private property backyards. Most mosquitoes bite at dusk or at night, but some kinds will bite during the day. Almost all mosquitoes will bite if you enter an area where they are resting. Mosquitoes can transmit serious diseases to humans, such as the West Nile Virus. To date, the DuPage County Mosquito Trap Surveillance program has not found any mosquitoes with the West Nile Virus in the Village. 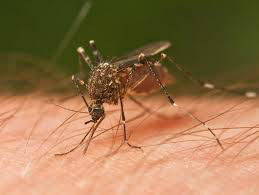 However, generally by the end of the summer, multiple locations throughout DuPage County will have mosquitoes with WNV. Make sure that doors and windows have tight fitting screens and repair any holes. Keeping grass and weeds cut short to eliminate hiding places for adult mosquitoes. Apply mosquito larvicide tablets available from local hardware stores to standing water locations in private backyards, per label directions, to suppress mosquito breeding. For more information about the Village's mosquito abatement program, please contact Village Forester Kerstin G. von der Heide at 630-434-5475.